Scientists are trialling a technique to trick the brain into enjoying low calorie foods. Several natural aromatic molecules can make foods with less fat, sugar or salt more attractive to consumers, new research finds. These aromas make the brain believe that foods or desserts contain more salt, fat or sugar than they actually do. “Most consumers know that they should be eating more healthful foods made with reduced amounts of fat, sugar and salt. But this is problematic because these are the very ingredients that make many of the foods we like taste so delicious. 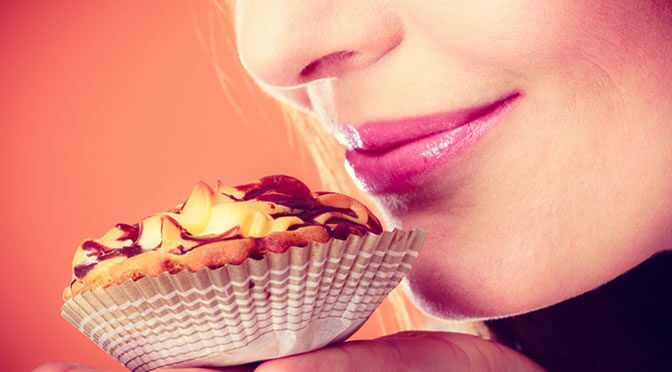 Smell changes our perception of food: while you eat, try pinching your nose and you will notice you can’t taste as much. This simple fact made food scientists come up with the idea of improving the flavour of food and beverages by using botanical extracts, essential oils and aromatic compounds. Studies are now examining different aromas to enhance the taste of low fat, low sugar or salt foods and drinks since most people avoid buying them due to their bland flavour. “If you buy a product made with 30 percent less salt, and you don’t like it because it isn’t very tasty, what do you do? You’ll probably reach for the table salt and put some into the product. So the target is missed. In the study participants were asked to test a flan, a shortcrust pastry containing different amounts of salt and ham aroma. The research team found that the perception of saltiness of the flan was increased with ham aroma despite the fact it contained no salt. Then the team tried a way to isolate aroma molecules related to sweet tastes. They created a device called a Gas Chromatograph-Olfactometry Associated Taste (GC-OAT). They used this device in conjunction with Olfactoscan (a tool used for screening aroma and taste interactions). The study subjects were asked to smell the aroma of real fruit juice through the Olfactoscan tube and in the meantime the researchers isolated the molecules from the juice using the GC-OAT device. Then one at a time they added the molecules into the Olfactoscan tube. As participants smelled each of these mixtures, they were asked if the fruit juice tasted sweeter. These findings could help food manufactures formulate foods and drinks with more healthy options without ruining aroma, texture and the taste of products. The study was presented in September 2016 at the 252nd National Meeting & Exposition of the American Chemical Society (ACS).